Imagine a raspy-voiced bull-rider who's not afraid to get hands dirty but still enjoys a bit of comfort, in short, that is the character of the chair. 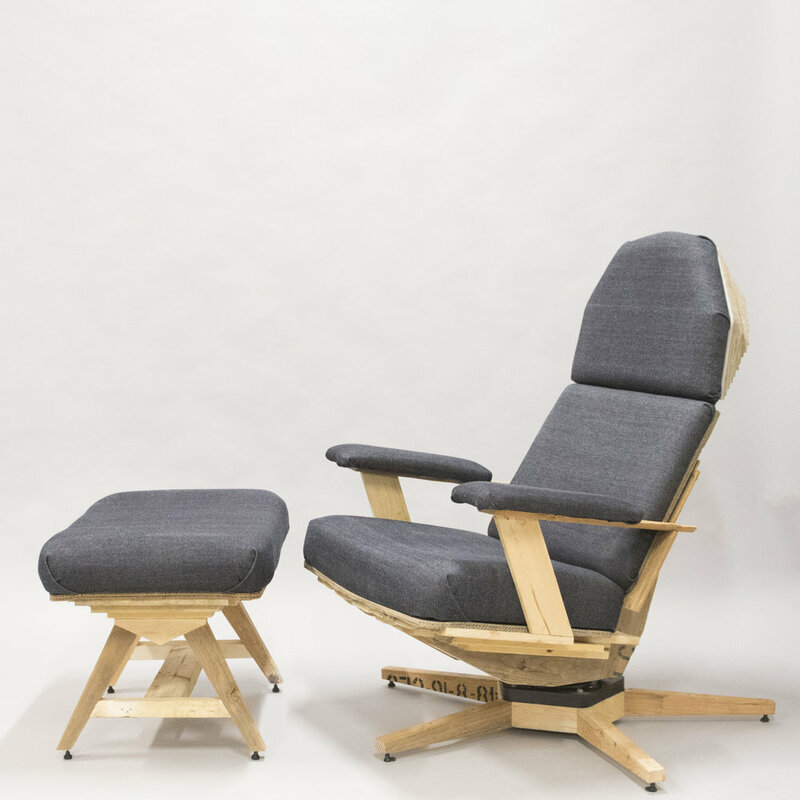 Similar to the idea of how pallets are used to transport goods all over the world: Precious cargo, supported by foam, protected by corrugated cardboard before being loaded onto pallets and then shipped, the build concept is the same: the person sitting in the chair is supported by upholstered cushions, protected from the harsh, rough pallet wood with corrugated cardboard. Admittedly the initial sketches did not get me very far, especially since at that point the sketches did not account for the dimensions of the stock I would be working with. To get the wood to convey the designs above, there would be so much planing and cutting that I was not sure if it would still be recognizable as being up-cycled from pallets. When D'Amore Interiors (Denver, CO) asked me to participate in their competition and the featured material was going to be up-cycled pallets, I must admit I was hesitant. Pallets are usually made from softwood and are sometimes treated with toxic chemicals to keep them from disintegrating or infested with bugs. Building furniture from pallets also seemed like a fad for a little while and everything seemed to look the same because people kept them whole. By deconstructing the pallets, more forms can be made. Finally, the beginning of an aesthetic concept was found when I saw an artichoke at my local grocery store, which led to how the slats of the pallets could be arranged to create a supportive surface, that led me to think of the Game of Throne's poster... but perhaps the chair should not look that extreme. While I did take apart the pallets from their iconic form, I did not want the wood to loose their identity, which is why the wooden pieces were only trimmed to their final size and shape but never planed or jointed. Like the construction of pallets, fastening hardware like screws and nails were left exposed; something I would hesitant to do for fine furniture. After the direction of the build and aesthetic concept were established, engineering can finally start figuring out how to make it work. All the seating surfaces, seat, back and head rest have a slight curve to them so a jig needed to be made. Actually two were made with two different radii. One for the placement of the pallet slats and another to vacuum press the plywood substrate the foam would be mounted to. Once the jigs were made it was time to sort through the stock and see what pieces were viable for use. These pallets were well used. Some slats had almost no integrity left after nails were dug out; then, sorted by color, thickness, length, width. Now construction of the actual chair can begin. The shell of the seat and back were constructed by laying pallet slats on one of the jigs and secured to each other with construction adhesive and brad nails. 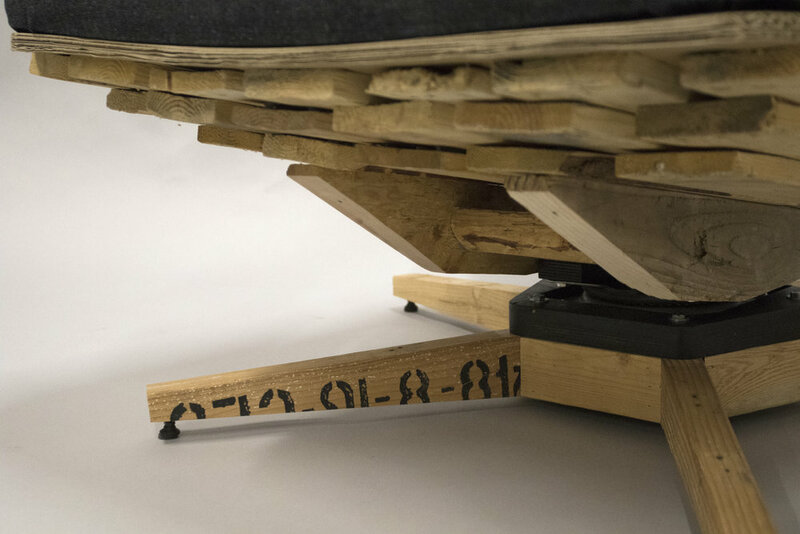 The legs and central support structure of the chair were made from the longitudinal stringers that are thicker stock. Mortise and tenon joinery were used for these parts. To create the gentle curvature of the seat, back and head rest for "Rusty", I laminated thin plywood sheets; then trimmed out the shapes I needed with 1 to 1 scale templates exported from CAD (and processed in Pepakura). Foam was attached and then upholstery was applied. Both vacuum clamping and upholstering were somewhat new to me. I've seen it done up close but never tried it completely on my own. It's nice to learn and try things new. The assembly of Rusty is pretty standard so here's a video fast forwarding through all the fun and games that is: making a chair.